Formula 1 newcomers US F1 and Campos Meta say they will race in 2010 despite F1 supremo Bernie Ecclestone casting doubt on their participation. Ecclestone told the Times that he did not expect either US F1 or Campos Meta to be on the starting grid in March. 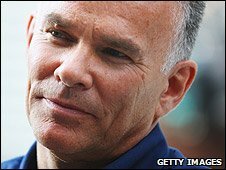 US F1 team boss Peter Windsor told BBC Sport: "I'm surprised Bernie said that. We will be there. We're in good shape." Campos owner Adrian Campos said: "My opinion is Bernie does not have all the information. We are working very hard." Next season's grid will be expanded after US F1, Campos, Virgin Racing and Lotus F1 were all ratified as new entrants in September. However, Ecclestone, the sport's commercial boss, suggested that not all of that quartet would make the season-opener in Bahrain on 14 March. "I think the people we expected to perform will and those that we thought wouldn't, won't," Ecclestone told the Times, which reported his doubts were focused on Campos and US F1. 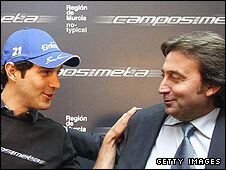 However, Campos are expecting the delivery of their car from partner Dallara in mid-January. Their preparations for 2010 have also seen them make a high-profile signing, handing an F1 debut to Bruno Senna, nephew of the late triple world champion Ayrton. "We are now very close to a title sponsor and a second driver," Adrian Campos told BBC Sport. "We will be there - otherwise we lose everything." Campos team principal Daniele Audetto added: "The car is almost ready. We are not in a situation where we cannot race." Windsor, who is US F1's co-owner with former Ligier technical director Ken Anderson, insisted his team were also on track. "Everything is going well and we are looking forward to the year," Windsor said. "We've just finished the chassis and are now in the hands of (engine suppliers) Cosworth." US F1 are constructing the car at their base in Charlotte, North Carolina but Windsor said that the team did not yet have a deadline for completion. And while each of the other new teams have at least one driver confirmed, the American team are still keeping their options open. In addition to Campos signing Senna, Lotus have signed experienced race-winners Jarno Trulli and Heikki Kovalainen while Timo Glock and Lucas di Grassi will drive for Virgin Racing. "We are trying to find the best drivers we can; there's no rush," said Windsor, a former team manager with Williams. "We have no date [for car completion]. It's difficult to predict when that date would be. "However, there will be a moment when we announce the drivers at the factory and that will be some time towards late January." Cosworth is supplying engine to all four of the new teams, as well as established racers Williams for 2010. Cosworth commercial director Mark Gallagher told BBC Sport the five teams were at different stages in their development but insisted all of them were pushing ahead. "We've been working with the four new teams for six months and have only seen signs that they are preparing for F1," Gallagher said. "There is no indication that operationally there are any issues." The first target for F1's protagonists is pre-season testing in Valencia on 1-3 February. The teams are expected to abandon plans to unveil their cars in a joint launch at the end of January because many teams will not have their 2010 specification cars ready in time.